This year, I made homemade Satsuma, Navel Orange, Grapefruit, Lime, and Kumquat “Cello” (liqueur) for Christmas presents for a number of friends and some of my work colleagues. 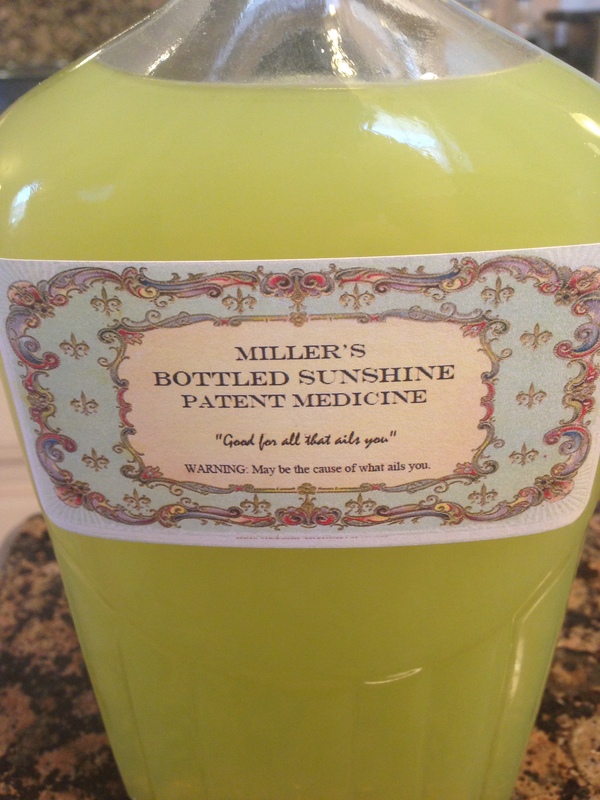 Because I’m a Registered Patent Attorney, it’s labeled as “Patent Medicine,” which I think is clever, even if I do say so myself. I’m writing this post to document the process (for reference in future years) and to answer people’s questions about how I made their gifts. A brief overview is that ‘cello is citrus extract (from soaking citrus zest in high proof alcohol) mixed with simple syrup. But, as you might guess, it’s much more complicated than that. 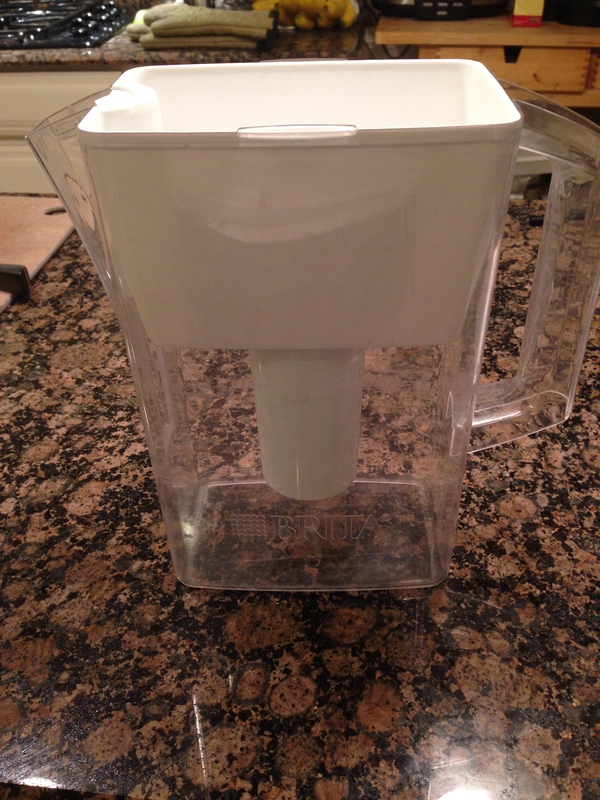 The first step is to get a water filter. I found mine at Bloomin’ Deals (a local thrift shop) and got replacement filters from Amazon. 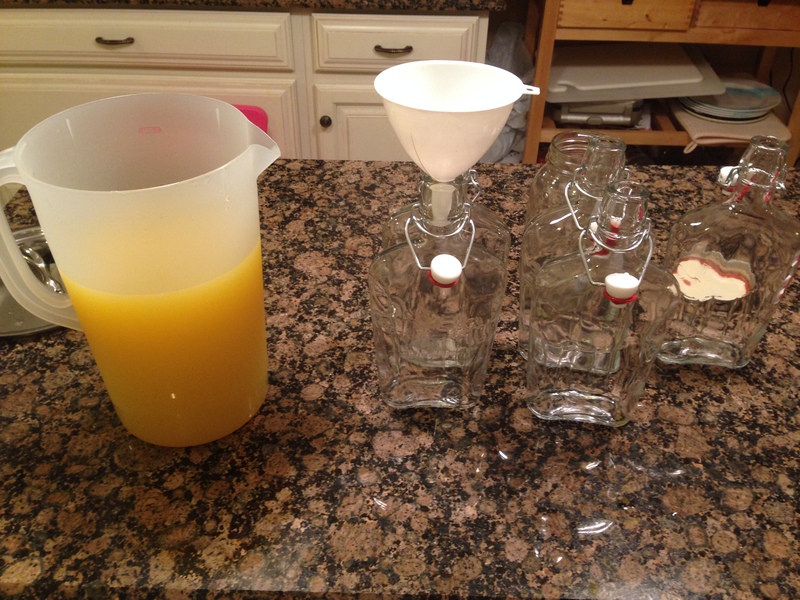 The next step is to get some neutral alcohol to extract citrus oils from citrus zest. 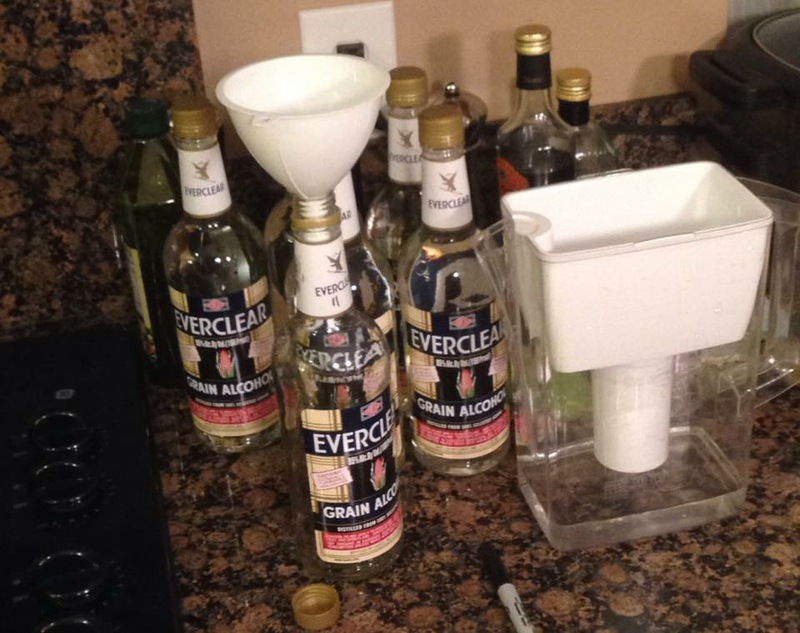 The conventional wisdom is that the higher the proof, the faster the extraction goes, so I use 190 proof Everclear. However, I filter the Everclear 7 times before starting the extracts. Filtering the Everclear (hash marks on the bottles indicate number of filtrations). The next step is to acquire some nice citrus and wash all of the citrus in warm soapy water, using a scrub brush. 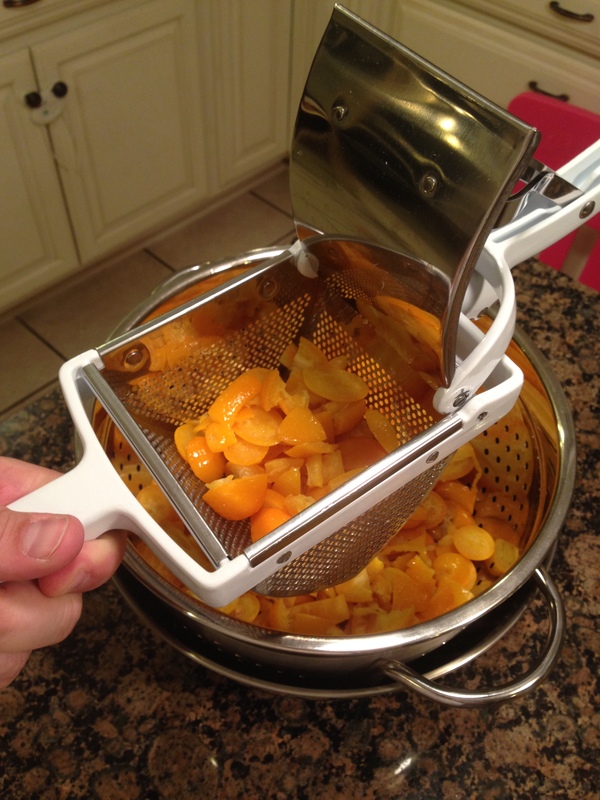 Then, dry the fruit and take the zest off using a microplane grater. Sorry, no pictures of this. 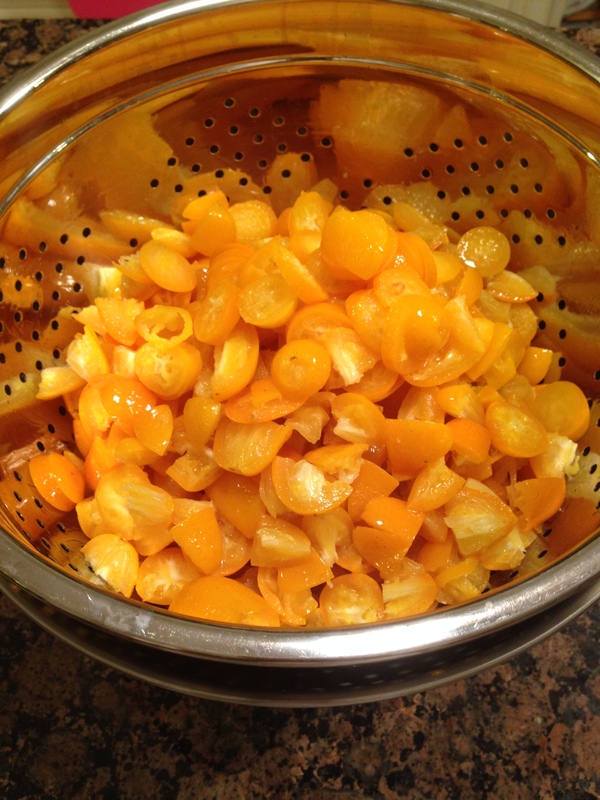 Also, Kumquats are so small, I used them whole (after chopping and removing all the seeds). 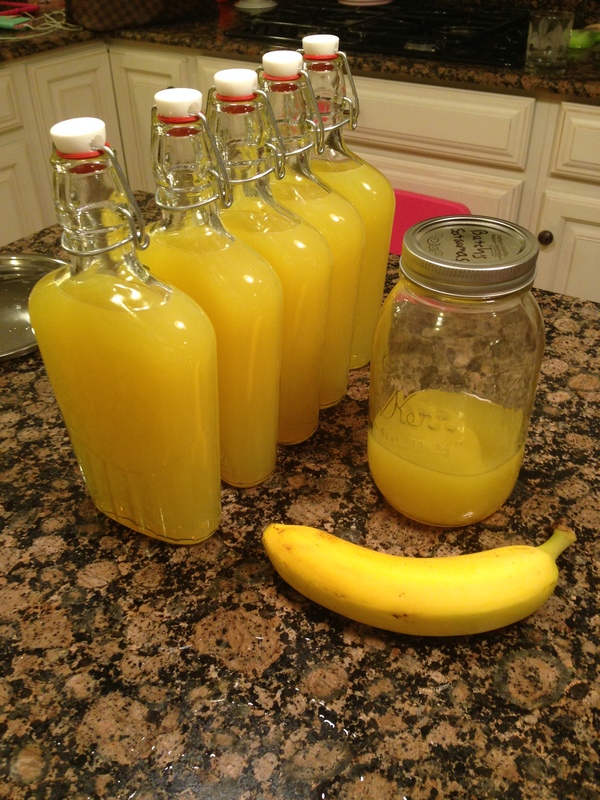 After removing the zest, mix with neutral spirits and store for 1-2 weeks, shaking every other day. 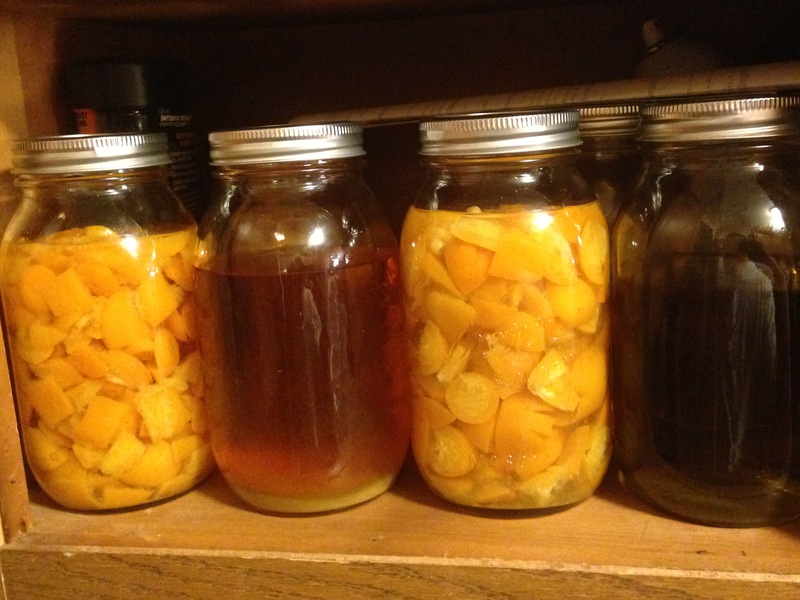 I store mine in one quart mason jars. This size works pretty well with 750ml bottles of neutral spirits. I used Satsumas from Butch’s Place in Paulina, Louisiana, Satsumas from Becnel & Sons in Belle Chasse, Louisiana, Rio Red Grapefruit from Texas (I could not find any Louisiana Grapefruit this year), Louisiana Navel Oranges from Belle Chasse, Louisiana, Persian Limes from a co-worker’s tree, and Sour Kumquats from a co-worker’s tree. 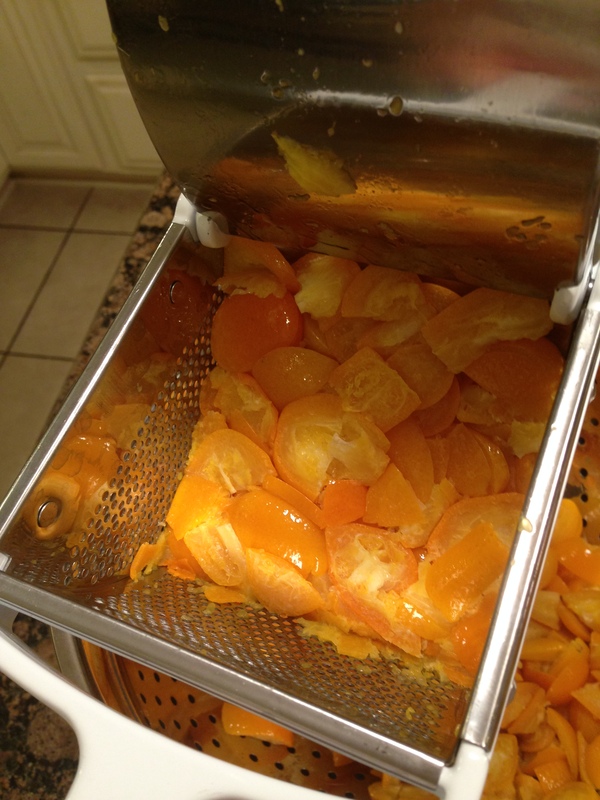 After removing most of the citrus zest (either as shown above with Kumquats, or simply using a mesh strainer), there will still be some solids left over (see the sediment at the bottom of the jar in the picture above). 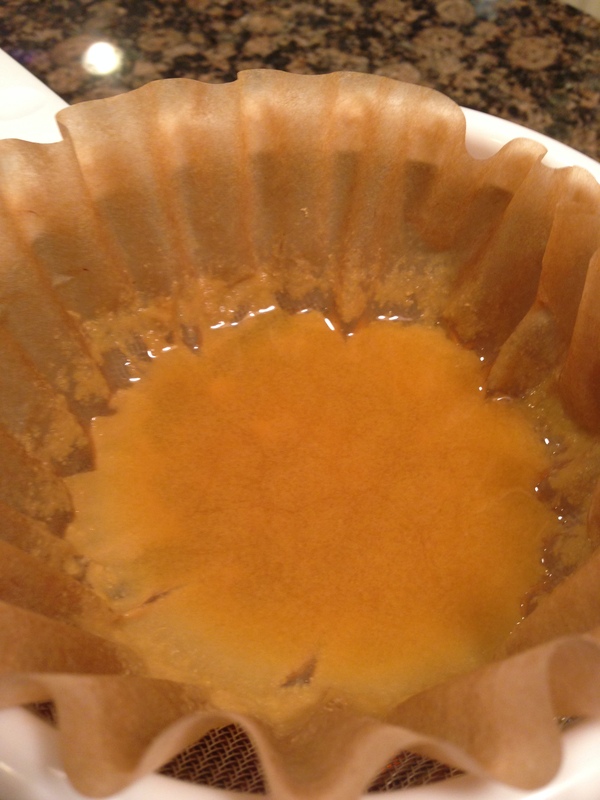 Filter these using coffee filters (I used unbleached). 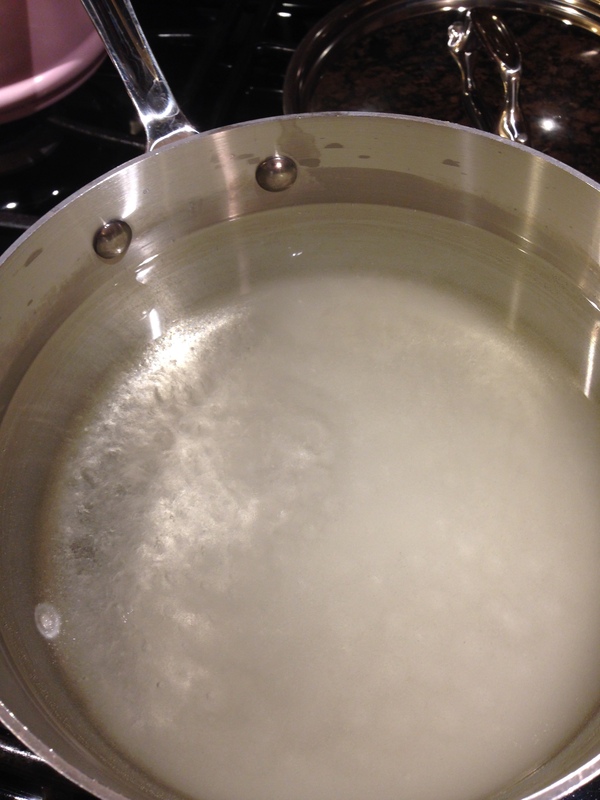 The next step is to make a simple syrup (sugar water). Most cocktail simple syrups are usually 1 part sugar and 1 part water. 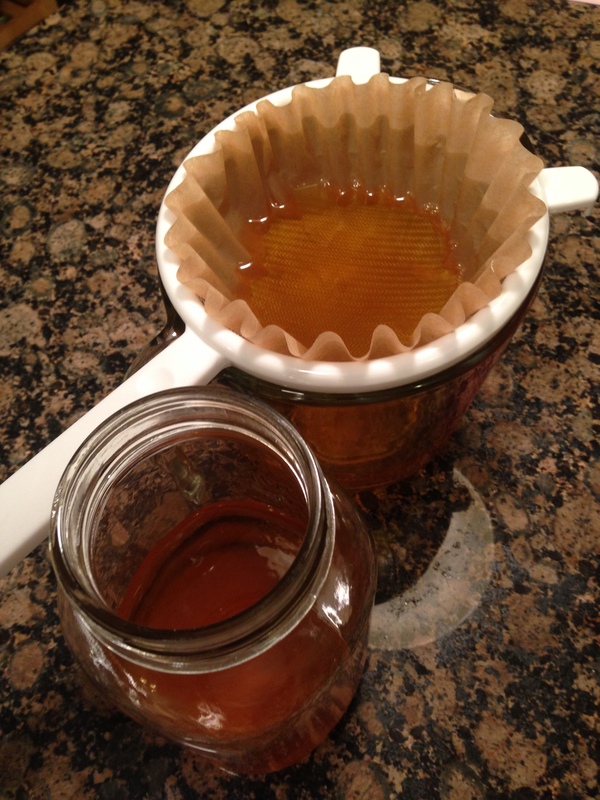 The sweetness of simple syrup and the amount added can greatly impact the end result. 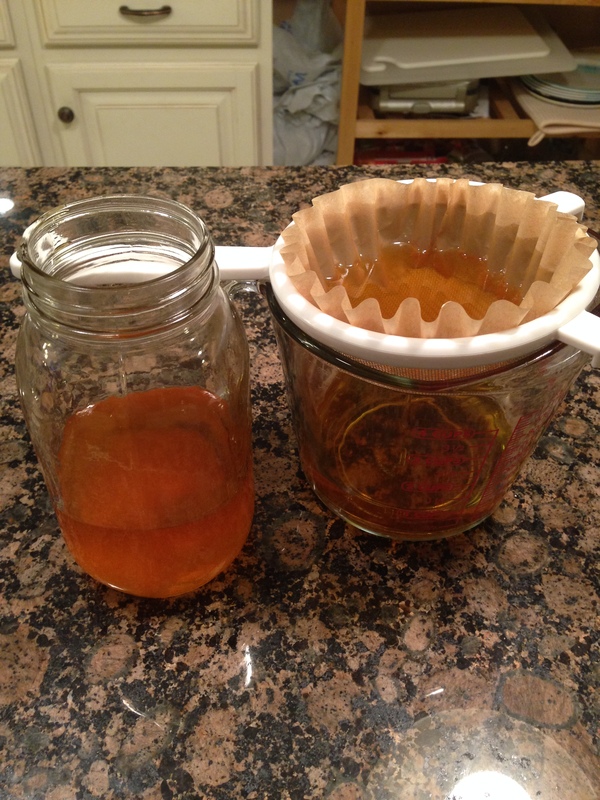 For this project I used a 2:1 ratio for my simple syrup. I used 3.5 cups sugar and 7 cups water. After cooling this yielded about 2 liters of simple syrup, which I mixed with 700ml of filtered extract (I lost about 50ml in the Brita filters, coffee filters, and random drips and spills). 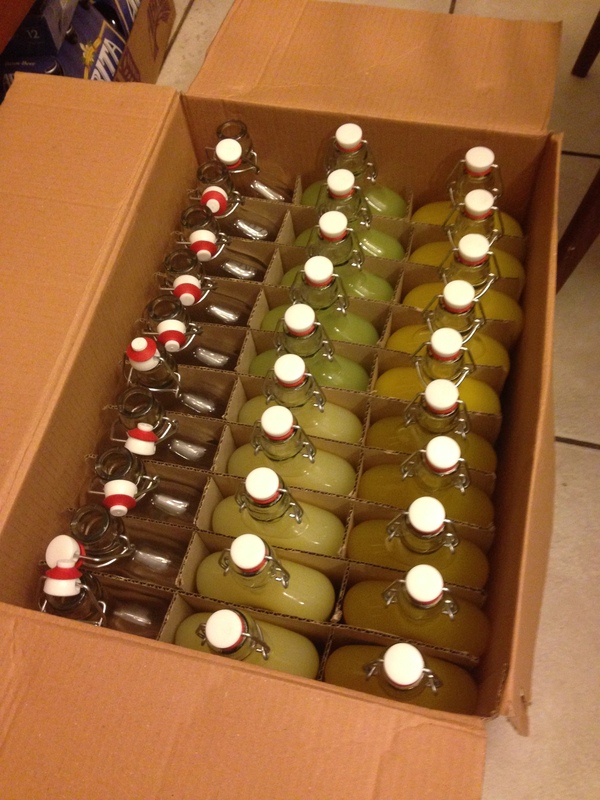 I was aiming to make about five 500ml bottles of 60-70 proof final product. Also, I used this Limoncello Calculator. 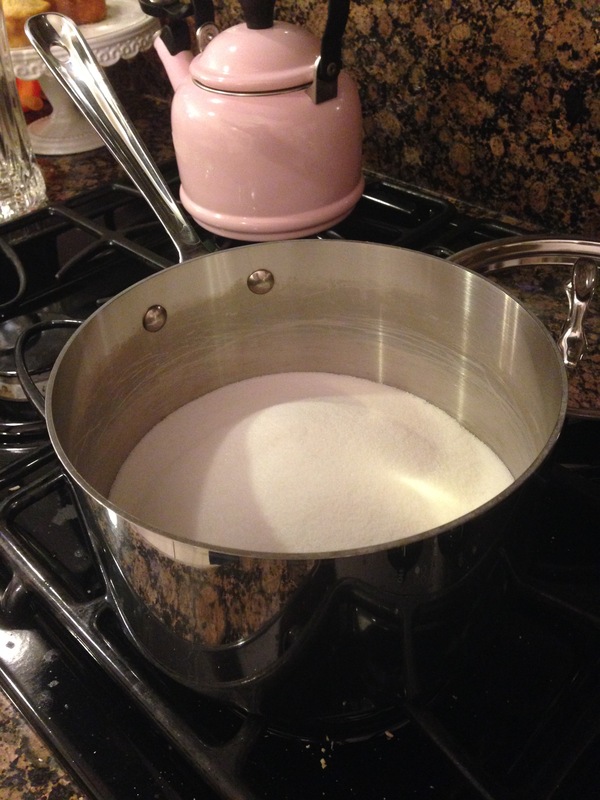 Sugar in a Pot. Yes, that is a pink Le Creuset Teapot. Deal with it. Heating Up Even More. This is one of my favorite parts because the simple syrup is not completely mixed at this point, so different parts of the mixtures have different densities and bend the light differently. 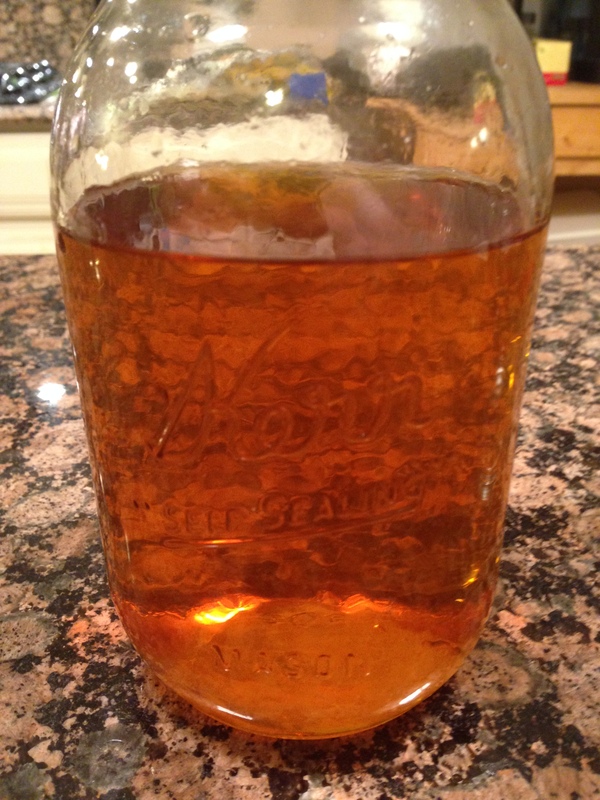 Once the simple syrup is made, wait for it to cool off completely to room temperature. 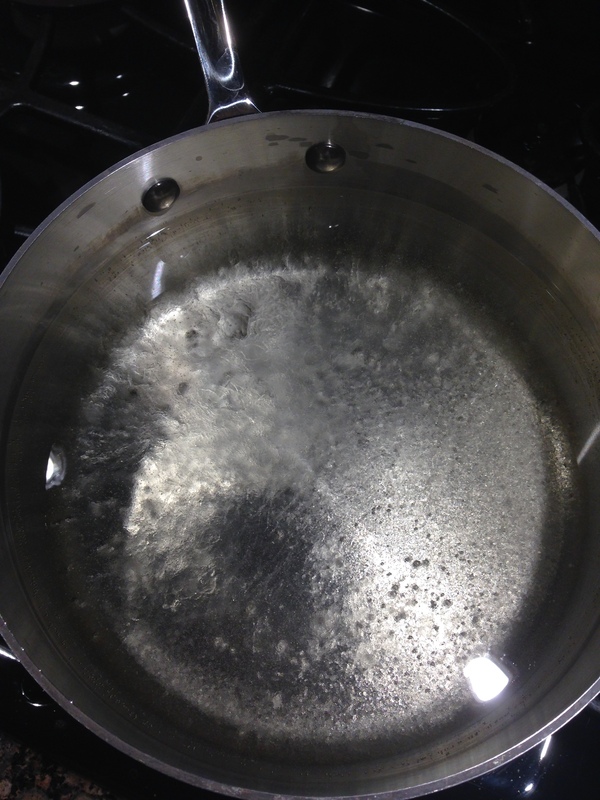 The best way to do this quickly is to put the pot in the sink with some ice water. If you don’t wait for the simple syrup to cool, it will cause the end product to develop a ring of citrus oil around the top (this is fine, it’s just not pretty). Once the simple syrup is cool, mix with citrus extract. This will cause a “louche” or “ouzo effect” whereby certain compounds in the extract, which are fully in solution in 190 proof ethanol, partially precipitate out of solution and turn the mixture cloudy. For the curious, there’s a MetaFilter discussion from a few years ago about the subject. At this point, you need bottles. I used these 500ml glass bottles. The next step is to apply a nice label. Again, I’m labeling these as “Patent Medicine,” so I found a cool antique-looking label from WorldLabel.com. Bonus points for the fleur-de-lis. The quote and warning may sound familiar (thank you, Homer Simpson). Overall, I think that the project was a success. At the alcohol and sugar levels I used, the end product is not well-suited for drinking straight (the citrus flavors are overwhelmed by the sugar and alcohol). But, if served over ice, as the ice starts to melt and the drink becomes much more pleasing. As for the flavors, they are all pretty good. Lime is very good, tasting just like a key lime pie. Satsuma tastes… a lot like satsuma. Orange tastes… a lot like eating a fresh orange with just a hint of bitterness. As for grapefruit, I had hoped that it would taste the way a grapefruit smells when zesting. However, the extraction process captured a fair amount of the less pleasing (to me) grapefruit flavor. If you like grapefruit a lot, then the result is probably great. As for me, the grapefruit extract actually works well in a bourbon cocktail. The grapefruit cello acts as a combination of bitters + simple syrup, so just mixing 1 part grapefruit ‘cello with 2 parts bourbon over ice is pretty nice. I am a former software engineer turned lawyer, practicing patent, trademark, copyright, and technology law in New Orleans, Louisiana with Carver Darden. You can read more about me, or find out how to contact me. You can also follow me (@NolaPatent) on Twitter, Google Plus, or Linked In. All content on this website is subject to disclaimer.